Push Mount cable ties are recommended when an application requires one step fastening. The push mount portion of the cable tie is found outside the head of the tie and is pushed into a predrilled hole and locks into place. Push Mount cable ties provide a constant tension and enable a stable and secure fixture. The one piece construction with a push mount feature outside the head of the tie allows for consistent performance and reliability. 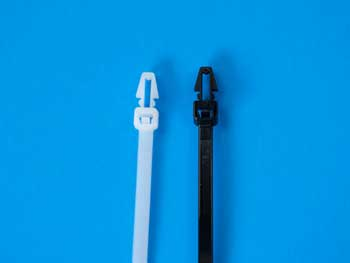 Natural mounting hole cable ties are preferred for indoor use applications while UV Black is recommended for outdoor applications, providing greater resistance to ultraviolet light. Push Mount cable ties are available in two different designs – those with wings and those without wings. When space is a consideration, the wingless push mount ties would be preferred and recommended. Winged Push Mount cable ties are available in an 8” length with a tensile strengths of 50 lbs. Wingless Push Mount cable ties are available in 6” and 8” lengths and have a 40 lb or 50 lb tensile strength. Packaging of both styles of the Push Mount cable ties is in bulk 1000 or 500 piece bags or smaller 100 piece bags. Tensile Strengths – 40 and 50 lbs.